Lavender Aphrodisia: Glycine Soya (Soybean Oil), Salt, Fumed Silica, Glyceryl Monostearate and PEG-100, Octyl Palmitate, Sodium Laureth Sulfate, Silicone, Glycerin, Methylchloroisothiazolinone and Methylisothiazolinone, Amyris Oil, Balsam Copaiba Oil, Basil Oil, Eucalyptus Oil, Lavandin Grosso Oil, Lemon Oil, Nutmeg Oil, Patchouli Oil, D &C Violet 2, Aluminum Lake Red 33, Aluminum Lake Red 40, Aluminum Lake Blue 1. Vanilla Lemongrass: Glycine Soya (Soybean Oil), Salt, Fumed Silica, Glyceryl Monostearate and PEG-100, Octyl Palmitate, Sodium Laureth Sulfate, Silicone, Glycerin, Methylchloroisothiazolinone and Methylisothiazolinone, Lemongrass Oil, Grapefruit Oil, Lemon Oil, Peppermint Oil, Vanillin, Aluminum Lake Yellow 5, Aluminum Lake Yellow 6, Aluminum Lake Red 40. Designed to soften the skin and remove dead skin cells. 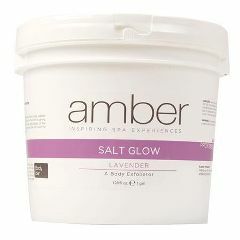 Amber's Salt Glow helps to prepare for Masque and Serum application allowing for more effective nutrient absorption by exfoliating and renewing skin. Dead Sea Salts blended with ultra-hydrating oils and pure essential oils create an intense exfoliation for the entire body.